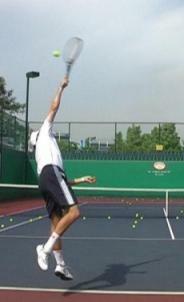 Developing a reliable topspin tennis serve is the key to advanced tennis. Unless your second serve is safe, accurate and difficult to attack, you will be under pressure on every second serve. You can also use a topspin serve as a variation on the first serve, especially when you want to increase your first serve percentage. This topspin tennis serve guide is useful for tennis beginners who have just started to learn the serve. There are a few key differences between a flat serve and a topspin serve, differences that may not seem obvious at first. The contact point for a topspin serve is lower. The body is more sideways at contact in a spin serve than in a flat serve. The contact point for a flat serve is more in front and slightly to the right, while the contact point for a topspin serve is above, or slightly behind, the head. When you serve flat, you momentum takes you more into the court than when you serve with topspin. The sound of hitting the ball is different. Before you start learning the complete technique of a topspin tennis serve, you can already work on developing a good feel for topspin. The following two drills are good introductory exercises to getting the feel for a topspin serve. Skill in playing a topspin groundstroke doesn't automatically translate to hitting a topspin serve easily. The racquet moves in a different way. By using the drills above, you can experience and feel how to spin the ball with a serve. The second part of the guide combines developing good feel for topspin with correct serve technique. 2. Let the momentum of your arm turn your body toward the service box. 4. Progress to a full backswing and topspin serve. The goal of the topspin tennis serve is greater margin for error both above the net and before the service line. Therefore, when you practice the above drills, keep in mind that you need to serve up and make the ball dip down with topspin. Don't serve down: let the spin and gravity take the ball down. What would your body do naturally if you wanted to throw a tennis ball as far as possible? Try it and you'll see. In most cases, you automatically feel what you need to do for more power. You bend your knees slightly, coil your body, make a bigger backswing and accelerate your arm. Just apply the same to your topspin tennis serve, and you will add more speed and spin to it. the difference between poor leg drive and good leg drive so that you can also learn visually. that you can add more power to your spin serve by tossing the ball inside the court. a simple drill with an obstacle to achieve both good leg drive and toss inside the court. To increase racquet head speed, think "fast" instead of "hard". To move very quickly, your muscles need to be somewhat loose. Try a few swings without the ball and listen to the sound. Try to make a "swoosh" sound when you swing. Then swing at the ball with the same speed. Once you get the basics of the topspin serve working, you can refine your technique and feel for it. 2. "Serve as high as possible" is a similar drill. It requires very fine touch and brush on the ball. If you hit just a little too much into the ball instead of upward, you won't be able to serve in the service box. 3. Serving above the rope is a very realistic drill in which you try to keep a good height over the net and put a lot of topspin on the ball to make it dip into the service box. 4. Andre Agassi used to serve from one corner, kick the ball out wide, and then play into the open court. If you practice the Agassi kicker, you will not only develop a tactically good serve, but you will also improve your feel for the topspin tennis serve. 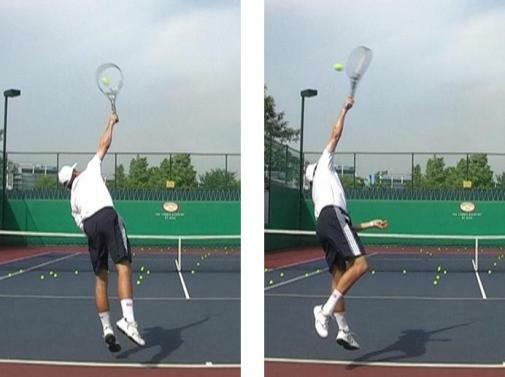 Learning to hit a topspin tennis serve is not a difficult thing if you follow the above progression. What takes a little more time and perseverance is getting really good at it. The effort is definitely worth it, since a reliable second serve will give you confidence for your first and second serve and allow you to surprise your opponent with an occasional high bouncing kick serve. Let me know how you are doing or even better - send me a video of your topspin serve and we'll find more ways to improve it.